UH-Downtown President William Flores and First Lady Noel Bezette-Flores at the Volunteer Houston awards event at the Bayou City Events Center. 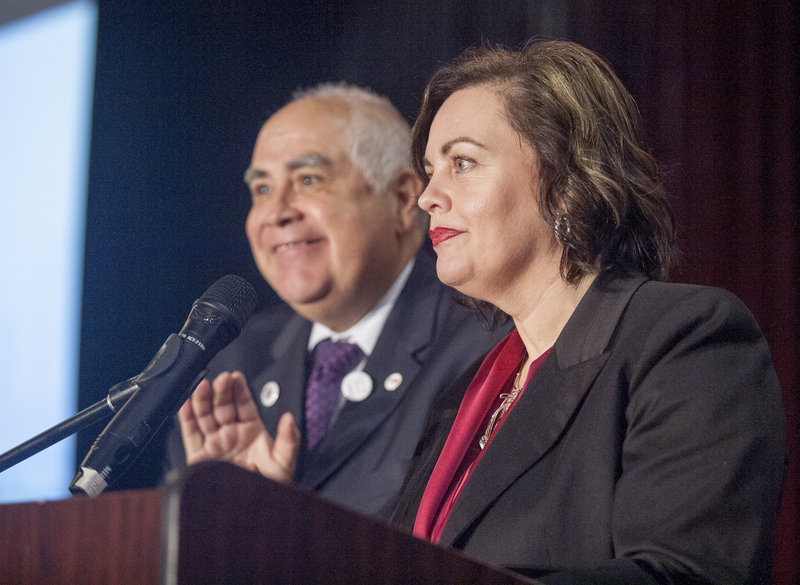 UHD President Bill Flores and First Lady Noël Bezette-Flores will serve as host committee members and education panel presenters for the 2015 Points of Light's Conference on Volunteering and Service taking place Oct. 18 through Oct. 21 at the George R. Brown Convention Center in Houston. Points of Light's conference is the largest gathering of nonprofit, government and civic leaders in the world. Participants come together to learn, share and inspire one another to increase the number of global volunteers and to bolster their efforts. The 2015 Conference specifically will focus on the next generation of volunteers and how they are developing new ways to change the world. "I am honored to have been invited to participate and to share the innovative, powerful ways in which UHD students, faculty and staff are serving the Houston community," said Flores. "I encourage faculty and staff to attend the entire conference, especially the Higher Education Roundtable, where we will discuss the emerging issues, trends, challenges and opportunities in service learning and community engagement." Following is a list of the conference's education sessions. If you would like to register for any of the sessions below, please contact Julie Norton at nortonj@uhd.edu . October 19, 2015 | 8:30 a.m. - 10:00 a.m.
October 19, 2015 | 10:30 a.m. - 12:00 p.m.